Note 1: Around 2014, I instituted a policy regarding both my blogs that I do not include links to other people's websites or blogs on mine. Consequently, you will only find information on how to locate the links (I often include screenshots of the webpages in question). Further clarification can be found in the bibliography. Note 2: The two photos taken at Museum London are included with permission. I obtained an additional permission from the Canadian Museum of History for the one of Moo Cow and me. James Reaney (1926-2008) and my mother Jay (nee Fleming) Peterson (1920-1976), were both highly creative London, Ontario, Canada cultural activists. They were adept at not only getting projects off the ground, but also seeing them through to fruition. One of these projects was marionette plays for children. My mother convinced her fellow Western Fair board members to commission James to produce three shows for the September 1965 fair. Mom took a hands-on approach with one of the three. She invited James (or as I knew him, Jamie), his wife Colleen Thibaudeau, and their three children, James Stewart, John and Susan, to the Peterson family cottage at Leith, Ontario, in August 1965. The Apple Butter marionettes were brought to life in my late maternal grandfather, Stuart Fleming's, old print shop. 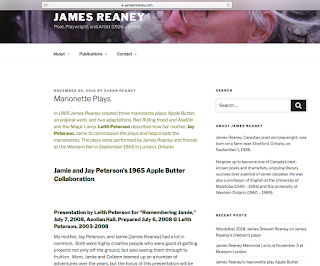 In his 1990 Theatrum article, entitled "Stories on a String," Jamie described Apple Butter as a "new venture. What I wanted to do in this fairy tale--where an orphan boy triumphs over the cruelties of his guardians--was to create a puppet hero for Southwestern Ontario. . ." The tale was based on a story Jamie's mother told him about 1890s Perth County. My mother designed "Moo Cow," an impressive-looking bovine, with the map of Canada built into the Holstein's black-and-white markings. Moo Cow helps Apple Butter get the better of "thick skulled" Victor Nipchopper, by hooking Victor with her horn, and then flying away with him to the moon. Around January 2009, what was then the Canadian Museum of Civilization (renamed the Canadian Museum of History in 2013) acquired some of the Apple Butter marionettes from the James Reaney estate. James Stewart Reaney, Jamie's son, explained this acquisition at the end of the November 29, 2010 post cited above. On November 3, 2018, I enjoyed attending James Stewart's lecture in the Museum London auditorium. It was entitled "I Was So Much Older Then: A reconsideration of Jamie Reaney's Plays for Children. . ." The London Public Library, Wordsfest and Museum London all played a role in bringing this talk to fruition. 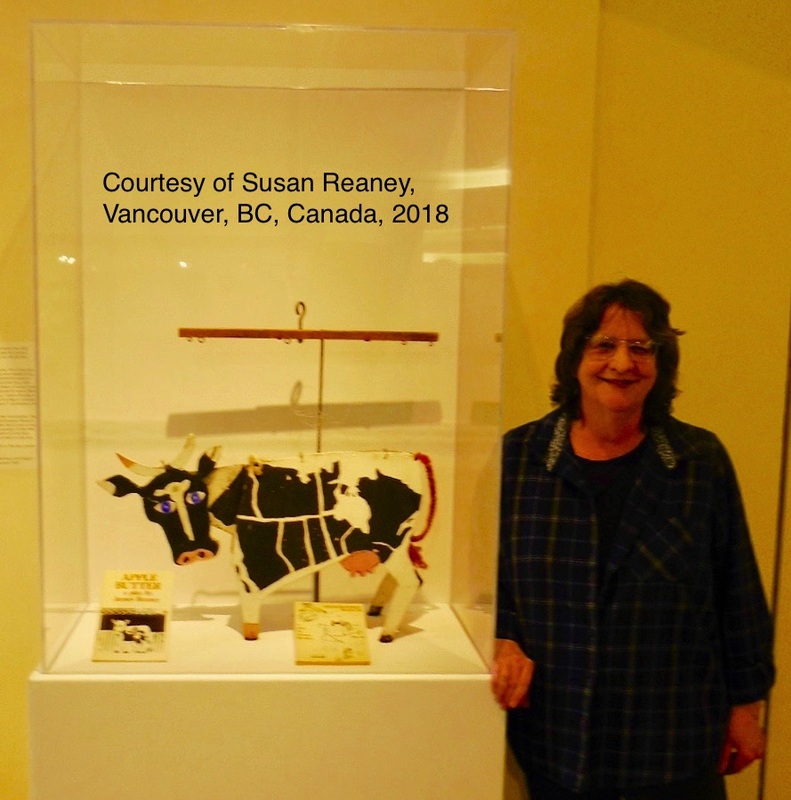 In addition, the Canadian Museum of History loaned Moo Cow and another Apple Butter marionette, Tree Wuzzle, to Museum London, to be housed temporarily in the Museum London lobby. Below is James Stewart giving his lecture. The photo of the Reaneys and Apple Butter was taken by my mother in August 1965 at Leith, Ontario. I am grateful to Susan Reaney, Jamie's daughter, and James Stewart's sister, who agreed to let me use her photo on my blog. After James Stewart's lecture, I had the pleasure of getting reacquainted with Mom's "Moo Cow" in the Museum London lobby. Susan Reaney kindly recorded this meet up and agreed to let me publish it on my blog. As I admired dear old Moo, I reflected on how enduring my mother's legacy has been, despite the fact that she passed away more than 41 years ago. Colleen Thibaudeau - Jay "reaching out to us all"
The first lesson in clay modeling for the Modeling and Sculpture Group sponsored by the Western Art League was taught last night at the Western Fair Arts building. Here, instructor Mrs. Charles Peterson, left, coaches two students modeling faces. The model, centre, Phyllis Eaton, poses for Dr. W.A. Andreae, Byron, and Mrs. Mary Jones, London, right. It was the first of six weekly lessons. I purchased a scan of the negative for the above photo from the London Free Press Collection of Photographic Negatives, Archives and Special Collections, Western Libraries, Western University. This is one of my favourite photos of my mother. Here is another example of my mother reaching out, this time to four-year old me, in December 1956. I am guessing that she was helping me design a Christmas ornament. From the late-1950s to the mid-1960s, my mother tried to get me engaged with the visual arts, e.g., enrolling me in arts courses. But I realized I did not have her skills in this area, and lost interest. Nevertheless, I think this calligraphy I did around 1965 (below) signals my move into writing as one of my primary interests. The "Calligraphy Leith" is in my mother's handwriting. The author of the quotation is English critic, essayist and poet, Leigh Hunt (1784-1859). Excerpt from The Farmer's Wife, Vol. 36 (1933), p 72. 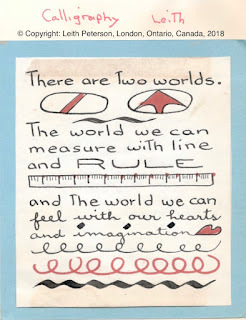 I like to think of this calligraphy as my "line and rule" nature constructively joining forces with my mother's imaginative heart. 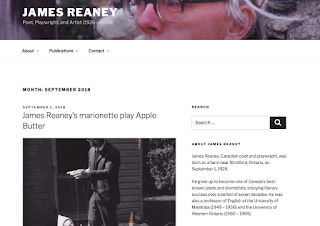 There is a lot that can be learned from examining the creative energies of my mother and James (Jamie) Reaney. 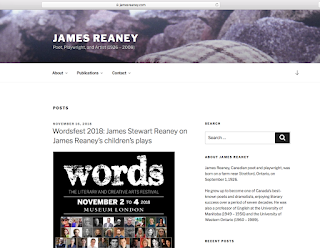 It is fantastic that Susan Reaney, James Stewart and his wife Susan Wallace have done so much to document this verve through presentations and website posts. And I have been happy to chime in from time to time on my https://www.leithpeterson.ca blog. London Free Press (1956, January). First Lesson in Clay Modeling. London Free Press. Peterson, L. (2003, May 10). Remembering Mom. London Free Press, p. F3. Reaney, J. (1973). 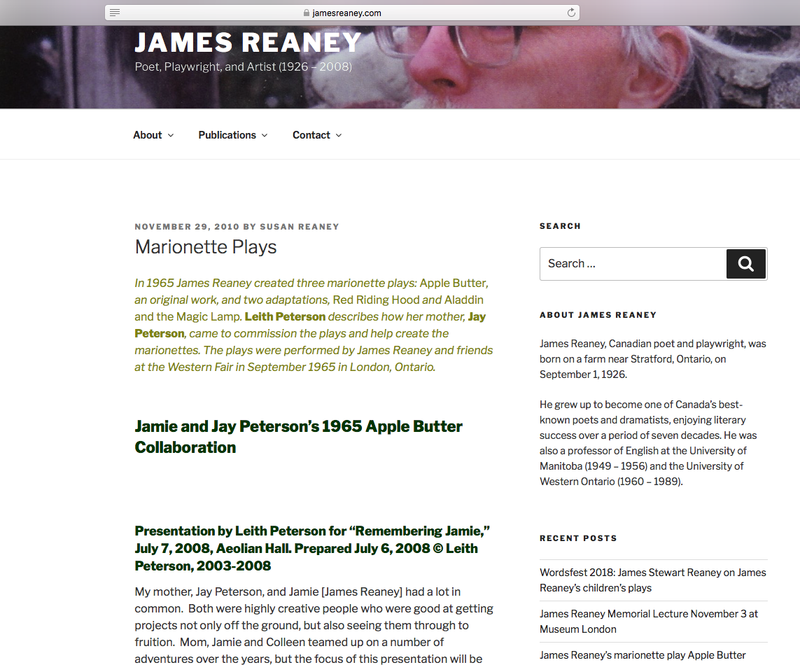 Apple Butter and Other Plays for Children. Vancouver: Talonbooks. Reaney, J. (1990, April/May). Stories on a String. Theatrum, pp. 7-8. Note: Photos of Allison Bosshart and family, Ken Whiteley and Reggie Harris, included with permission. On July 25, 2016, I published a leithpeterson.ca post about Ken Whiteley and my great-great grandfather, Michael Sullivan (1813-1886). Below is a link to this post. 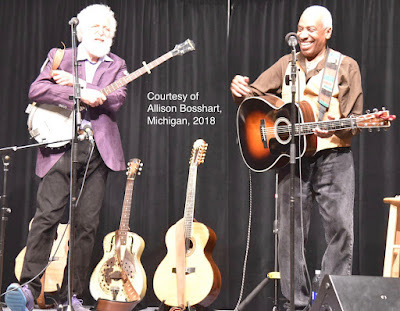 I explained that Ken is a "multi-instrumentalist, singer, songwriter [and] record producer" whose "musical journey has taken him from jug band, folk and swing to blues, gospel and children's music." He has won a Canadian Folk Music Award and a Genie Award for best original song, among many other accolades. Like me, Ken grew up hearing the story of how Michael Sullivan changed his surname from O'Sullivan to Sullivan, after he got on the wrong side of the Roman Catholic Church in Ireland. Michael ended up moving to Cambourne, in the Cornwall area of England. He courted a widow named Jane Trevillion (1816-1895). Her husband had been killed in the mines, and she was raising four children on her own. Jane told Michael that if he wanted to marry her, he would have to become a Methodist, and he complied with her wishes. 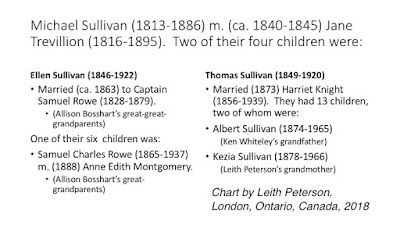 Around the 1840 to 1845 period, they wed in Cambourne, and subsequently had two children: Ellen Sullivan (1846-1922) and Thomas Sullivan (1849-1920). Thomas is Ken Whiteley and my great-grandfather. Michael was employed in the tin and/or copper mines. Around the late 1840s, copper was discovered near Sault Ste. Marie, Upper Canada. The centre of the find turned out to be Bruce Mines. This led to a call for experienced miners, including those in the Cornwall area of England. Michael, Jane and their six children crossed the Atlantic, ca. 1851, to seek a better life. On July 16, 2016, I enjoyed hearing Ken sing "That Other Shore" at the Home County Music & Art Festival Main Stage in London, Ontario. A couple of photos of Ken and my meet-up can be found in my July 25, 2016 post (link below). 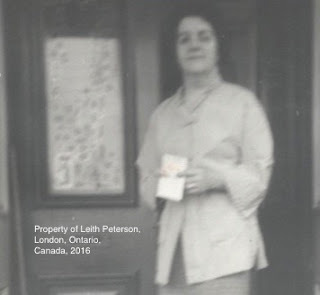 In July 2017, Allison Bosshart, who is the great-great-great granddaughter of Michael and Jane Sullivan, contacted me via my leithpeterson.ca blog. Allison is descended from Ellen Sullivan (1846-1922) who was the oldest daughter of Michael and Jane. Below is a chart that explains the connection between Allison, Ken and me. I helped Allison connect up with Ken. She was thrilled when he informed her he was playing twice in Michigan in May 2018. The first Michigan gig was on May 4, 2018 evening, and was entitled "Reggie Harris and Ken Whiteley - in Celebration of Pete Seeger!" It was part of the Ten Pound Fiddle Concert (tenpoundfiddle.org) at MSU Community Music School in East Lansing. Below is a photo of Ken and Reggie at this event. 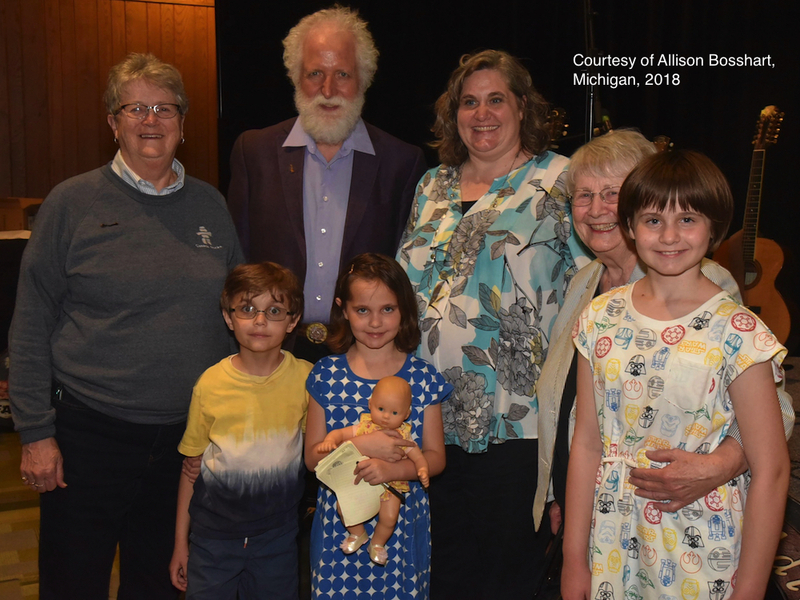 In a May 8, 2018 email to me, Allison described it as a "magical performance. . .We sang with a whole group of people about my great-great-great grandparents AND my children's great-great-great-great grandparents!! Wow!! Then on Saturday, May 5, morning, Ken performed at the "Fiddle Scouts Concert," which was the children's segment of the Ten Pound Fiddle event. Allison said she was "beside [herself] with joy and fellowship of music" when Ken invited her children up on the stage with him. She "kept wondering what would Michael and Jane Sullivan think?" On Saturday, May 5, evening, I was happy to be entertained by the music and camaraderie of Ken, Brent Titcomb, Liam Russel Titcomb, Fraser & Girard, New Cumberland with John P. Allen, and Nora Galloway. This was at the 8th Annual Smales Pace/Change of Pace Reunion at Aeolian Hall in London, Ontario. As Ken sang "That Other Shore," and dedicated it to me, I felt gratitude that my July 25, 2016 leithpeterson.ca post had widened the circle of Michael and Jane's living descendants. 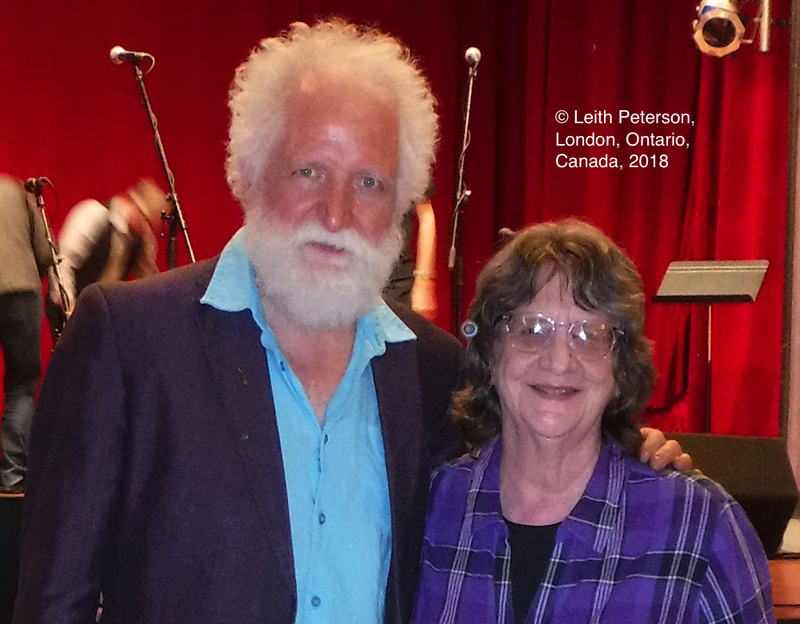 Below is a photo of Ken and me after the Smales Pace/Change of Pace Reunion Concert, at the Aeolian Hall. My mother, Jay Peterson (1920-1976), painted this girl, sled and snowman on the wall of my father, Charles T. Peterson (1913-2007)'s, periodontal office. My father's office was located at 281 Dufferin Avenue in London, Ontario, Canada. It is believed my mother painted this around 1961, along with other artwork of children engaging in various activities. If you want to see other images that she painted on the wall, click on the "Jay Peterson" label in the right sidebar. Scroll down to view my posts dated May 11, 2013 and December 15, 2016 (Part One of Four of the latter). My father retired circa 1977, and his office was torn down shortly afterwards. But before it was dismantled, he cut my mother's pictures out of the wall, and had them individually framed. 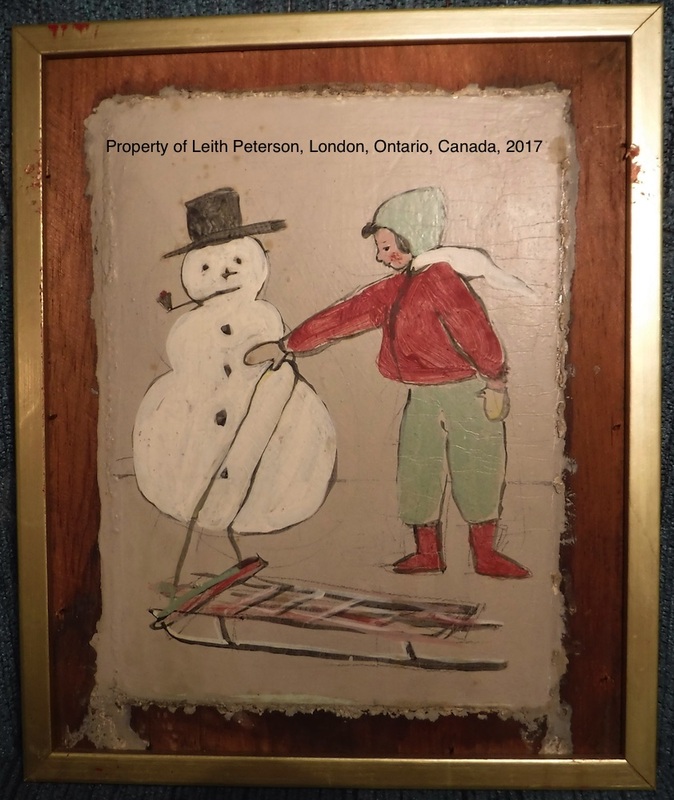 To make a long story short, two of about four that were previously at the Peterson cottage in Leith, Ontario, are now on the wall of my home in London, Ontario. Am grateful to my brother, Stuart Peterson, who, in August 2016, mailed me three more of my mother's paintings that had been on the wall of my father's office. My cousin, John Tinker, found them at my maternal grandparents' former cottage in Leith, Ontario. Consequently, I now have five of these treasured reminders of my mother. 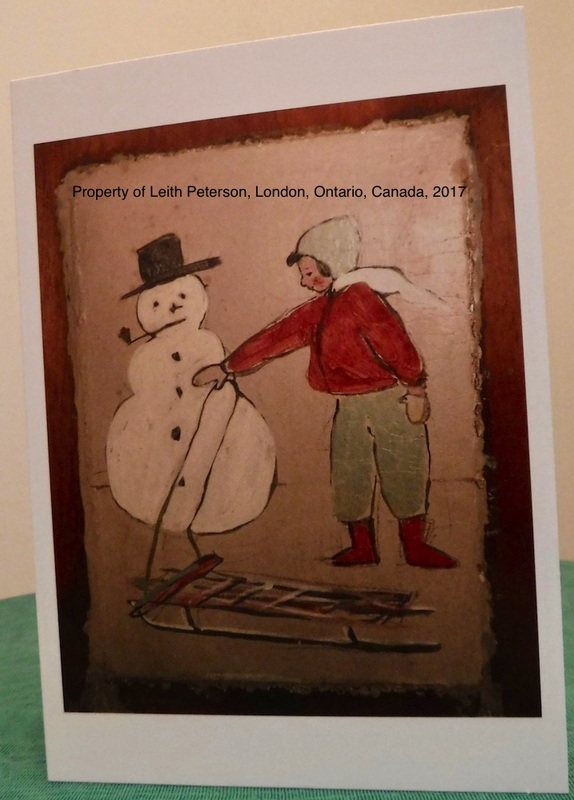 I incorporated my mother's girl, sled and snowman artwork into my 2017 Season's Greetings cards. This is the eighth year I have used her artwork to brighten up my end-of-year correspondence. For the previous seven years, I used the Staples Copy and Print online greeting card templates to create them. This year's card was developed via the Staples Live Design System. Here is a photo of the front of the 2017 card. The inside of the 2017 card. 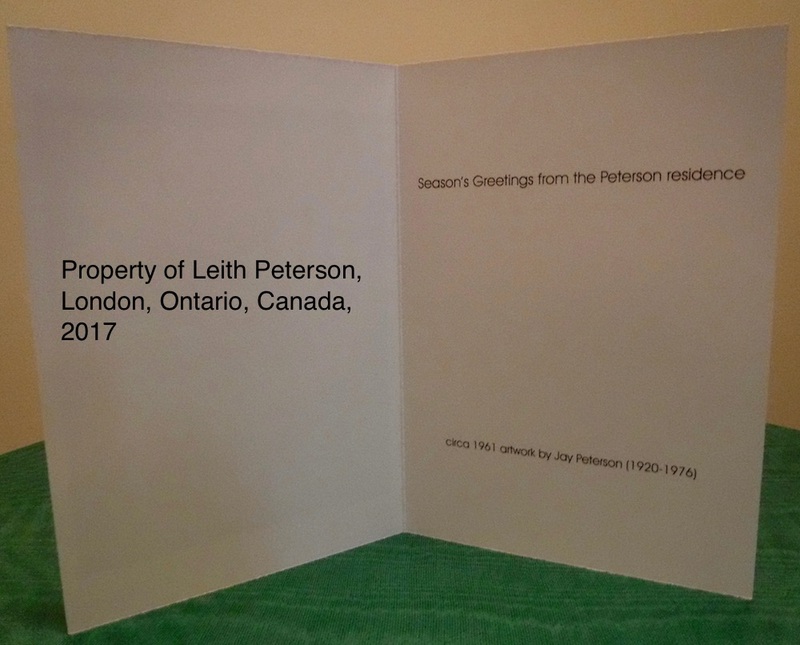 It says "Season's Greetings from the Peterson residence" because I provide my two surviving brothers (who also have the last name of Peterson) with multiple copies of the cards. This is so they can distribute them to their own network of family, friends and associates. I particularly appreciate the fact that my brothers pass on the cards to their children--my four nieces and one nephew--who never knew their grandmother, because she passed away before they were all born. 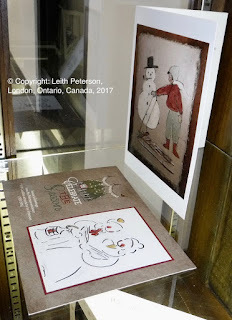 The Ivey Family London Room, at the Central Branch of the London Public Library, has been one of the recipients of my cards featuring my mother's artwork for all of the eight years I have produced them. I have happily complied with the London Room Librarian, Arthur McClelland's, request to provide additional copies of each year's card. This is so the staff can not only retain them in the archives, but also so they will have extras for display purposes. 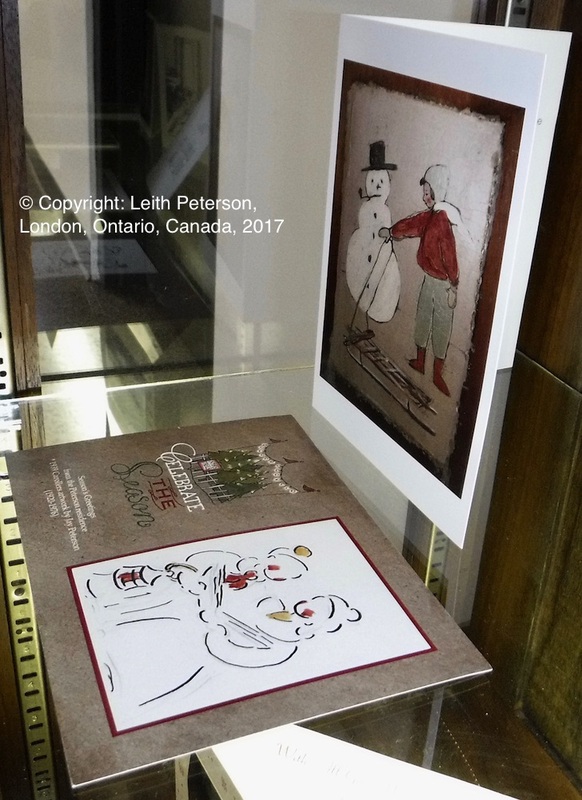 Barb Scott, the London Room Library Assistant, included both my 2015 and 2017 cards in this year's "Winter in London" display. In a Decembet 5, 2017 email to me, Scott explained that this year's focus is on "skating, tobogganing, outdoor ice rinks and such." 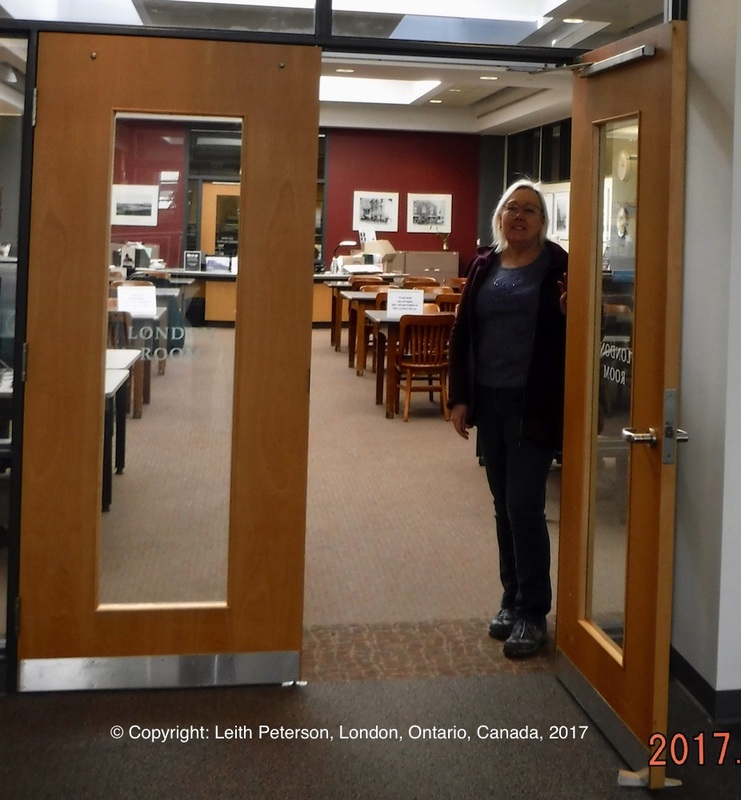 On December 6, 2017, I went down to the London Room to view the wonderful displays, which are housed in wall and flat cabinets in various parts of the repository. Here is a photo of Scott at the entrance to the London Room. 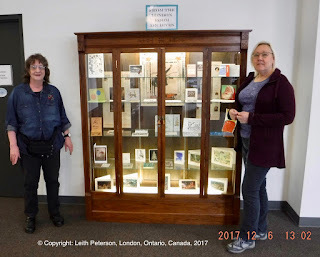 And this is one of Scott and I standing beside the display cabinet containing the 2015 and 2017 cards. This cabinet is located outside the London Room's front doors, on the left. The cards are on the second from the bottom shelf, on the left. The 2015 and 2017 cards in the display. Scott said the "Winter in London" display should be up until mid-January 2018. If you are in the London area during this period, I recommend checking it out. On July 31, 2017, I enjoyed being present at the London Room's 50th anniversary. This well-attended event included speeches, the unveiling of a new collection of historical postcards, and the launch of the book London: 150 Cultural Moments. So, if you do make it down to the London Room to see the "Winter in London" display, or, if you venture there at any point in the future, you will have an opportunity to see what more than 50 years of hard work, and a dedicated staff, have accomplished. London Public Library (2017, Summer). 50 years of local history. Access, pp. 1-2, 32, 42. London Public Library (2012, September). Ivey Family London Room [brochure]. My references to the writings of other people--both indigenous and non-indigenous--do not in any way imply that they share my views on this matter. The opinions expressed here are my own and do not necessarily represent those of my family, friends or associates. In April 2011, I launched not only this blog about me generally, but also my counterpoise.ca (counterpoise2.blogspot.com) which covers my views on indigenous issues. Some of my counterpoise.ca posts mention my mother, e.g., the fact that she was the main reason I got connected with the aboriginal "cause." However, until now, I have said very little on my leithpeterson.ca site about her work in this area. Part of the reason for this is my views on this topic have diverged substantially from my mother's over the course of the 40 years she has been gone. In fact, I have become so disillusioned with many aspects of the "cause," that, since about the mid-2000s, I have primarily been on the outside looking in. There are a few aboriginals who I keep in touch with, who share at least some of my views, but for the most part, I keep my distance from the whole scene. For further information about my opinions on this, you can check out my counterpoise.ca blog. In Part Four--Sections B to E below--I have tried to be as objective as I can about what my mother was doing at the time she was involved. Part Four - B Indigenous Visitors to 283 Dufferin Avenue in London, Ontario, etc. 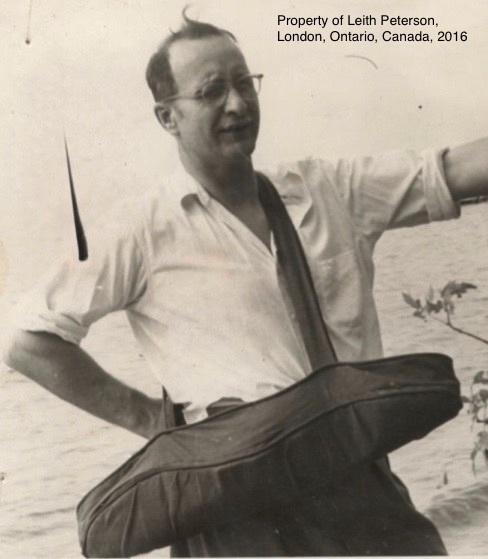 According to a biographical sketch my father put together around 1970, my mother "became interested in the plight of Indians* [in 1958] when she found a young teacher from Trinidad helping the Indians** without compensation on his summer vacation, and Canadians themselves not doing it." Mom frequently went to various aboriginal communities in the London, Ontario area--from Kettle Point to Cape Croker***--and visited with the native women. Often she would buy their crafts from them, sell the items in town, and then bring the money back to the women. What resulted was a lifelong friendship with natives on various reserves in Southwestern and Central Ontario and in the London area. My father shared my mother's enthusiasm for indigenous issues, particularly in connection with environmental stewardship. He told me that every year, for many years, he gave 5,000 saplings to both Oneida of the Thames and Six Nations--and planted some of them himself. One year, he said he gave 22,000 to Six Nations. No wonder his friends there called him the "tree man." His funeral program included an "Iroquois prayer." I recall a number of aboriginals who paid visits to our home at 283 Dufferin Avenue In London, Ontario, Canada. They included people from Six Nations, Cape Croker***, Oneida and other communities. I have various materials that document my parents' and my involvement during this period. These materials include guest book entries, correspondence, programs and news clippings. Our family home was filled with aboriginal crafts, including Mohawk pottery and corn husk mats from Six Nations, plus sweetgrass baskets and silkscreen-printed cards from Cape Croker***. My mother was active with the Indian-Eskimo Association of Canada (IEA) from about 1964 to 1973. G. Allan Clark, the Indian-Eskimo Association executive director, wrote a letter to my father, dated March 6, 1970, in which he extolled the many ways my mother supported the aboriginal cause. He said "Jay's home" provided support and encouragement for indigenous people, much like the N'Amerind Friendship Centre in London. Clark also talked about the exhibits she arranged at the Western Fair, to help educate the non-native population regarding native contributions to "Ontario's history and culture." I remember attending some of these Western Fair exhibits with my mother. As I recall, aboriginals from different communities, such as Cape Croker*** and Oneida of the Thames, demonstrated their skills, such as sewing intricate beadwork designs. When the Indian-Eskimo Association (IEA) moved from Toronto to Ottawa in 1973, there was a name change to the Canadian Association in Support of the Native Peoples (CASNP). My mother continued her advocacy work under the CASNP moniker from 1973 until her passing in 1976. The Fall 1978 CASNP Bulletin, entitled "On Native Women," was dedicated to my mother. Joanne Hoople, the CASNP executive director, described my mother as a "selfless worker throughout her adult life. . .who is remembered as someone who inspired others." 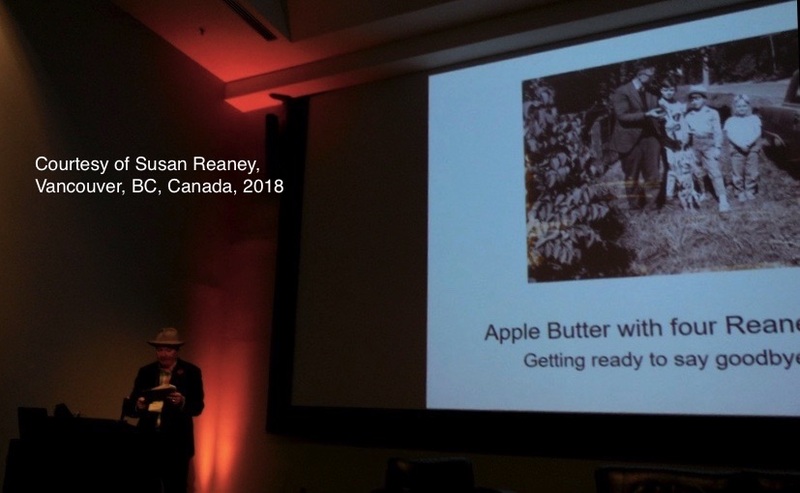 Hoople talked about my mother's contribution to the establishment of the N'Amerind Friendship Centre, as well as her work "furthering the objectives of the Indian-Eskimo Association" and then CASNP. My mother's B.A. 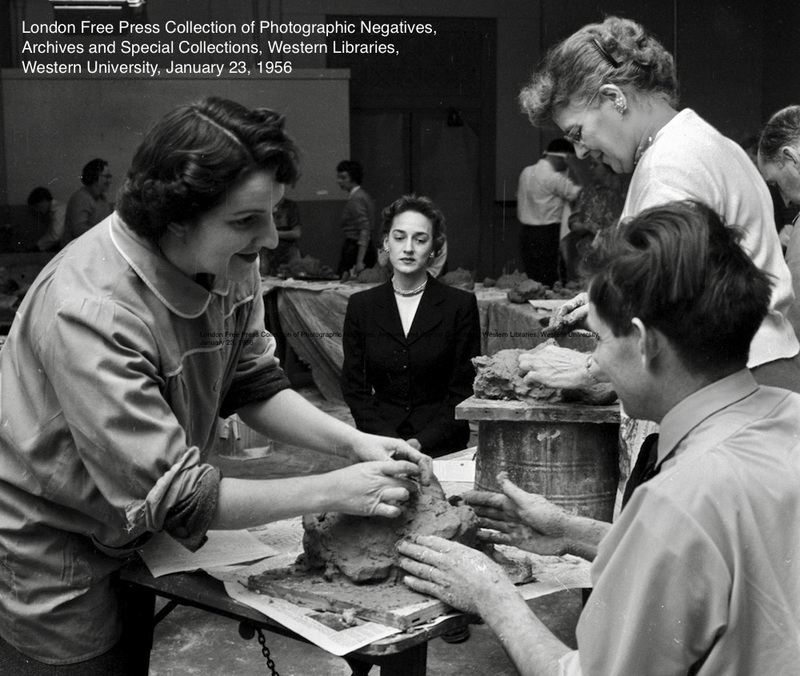 in Art History from the University of Rochester (1941) and her B.A. in Occupational Therapy from the University of Toronto (1943) heightened her appreciation for those who were creative and artistic. In addition, her 19th Century Scottish cotter ancestors had instilled in her a deep appreciation for folk art. In 1949, shortly after she moved to London, she wrote about the importance of folk art. She described it as the "art of the people," which included many homecrafts, such as weaving, sculpture, toy making and woodcraft. She said the Industrial Revolution had caused folk arts to die out, but that they should be revived. I think both her education and her interest in folk arts contributed substantially to her support for indigenous peoples' artistic and creative abilities. In addition, my mother was interested in symbolism in all its forms, so it is not surprising that she would be fascinated by the aboriginal version of this. For instance, she was intrigued by the Iroquois creation stories that include the "Turtle." 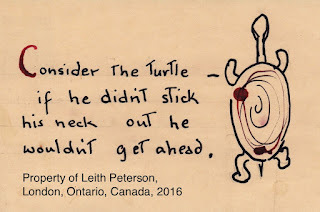 I am not saying my mother's turtle artwork below represents any indigenous story, but I think it is an example of how her connection with indigenous people heightened her appreciation for the natural world. She taught Native (a.k.a. Indian) Studies at Fanshawe College, in London, Ontario, circa 1970-1973. I have copies of some of the material she helped prepare for this course, including a one-pager entitled "Ways of Wisdom." Twenty-one aboriginals from different tribes across the country helped her assemble this document. It includes 11 observations, such as native people were more interested in "BEING than BECOMING." Some of the course content I have is unsigned and may have been written by others or in collaboration with others. Aboriginals who I am assuming were guest lecturers for the course also wrote some material that I found in her course files. However, I know that "Ways of Wisdom" was written by her because I have her handwritten drafts. It was difficult for me to write about this topic because, as I said in the introduction to this post, my views on aboriginal issues have changed substantially from my mother's over the past 40 years. Her experiences spanned an 18-year period, but mine have lasted more than 35 years. Although I share her view that non-aboriginal people need to be better informed about the history and heritage of indigenous people, my approach is quite different from hers in other respects. For more information on my views, you can look at my counterpoise.ca blog. * I realize that some indigenous people prefer that the term Indian not be used, but it was the word often employed at the time my father wrote his biographical sketch of my mother (circa 1970). In addition, Indian has a specific meaning under the terms of the Indian Act. See Gibson citation below for further information on this. Moreover, many aboriginals still call themselves Indian and do not find the term offensive. See MacBain citation below. Finally, no legal definition exists for First Nation, although many aboriginals prefer to refer to themselves this way. See my citation for the Government of Canada's TCPS 2 (2014) - Chapter 9 below. ** My father was referring to the Trinidad teacher "helping the Indians" in two or more aboriginal communities southwest of London. These communities are now called Chippewas of the Thames, the Munsee Delaware Nation and the Oneida Nation of the Thames settlement. Note that the first two are reserves, but the latter is a settlement. For further information on the history and current situation of these communities, refer to the relevant websites listed below. I found some of the content in the McCallum document (cited below) helpful for preparing the information on Southwestern Ontario aboriginals. *** Cape Croker has a very complicated history which is beyond the scope of this post. For further information, please refer to the Chippewas of Nawash Unceded First Nation site, which is listed in the citations below. Gibson, G. (2009). A New Look at Canadian Indian Policy. Fraser Institute. Pages 18-29 discuss the fact that Indian has a specific meaning under the terms of the Indian Act. Government of Canada (2015, July 7). TCPS 2 (2014) - Chapter 9 - Research Involving the First Nations, Inuit and Metis Peoples of Canada. Retrieved October 18, 2016 from the Interagency Advisory Panel on Research Ethics (PRE): www.pre-ethics.gc.ca. On page 21, in endnote #1, there is a reference to there not being a legal definition for First Nation. Hoople, J. (1978, Fall). In Memorium: Jay Peterson. On Native Women: CASNP Bulletin, p. 2. MacBain, R. (2016). Their Home and Native Land. Robert MacBain. See pages xi-xii for MacBain's explanation as to why he uses the term Indian in his book. 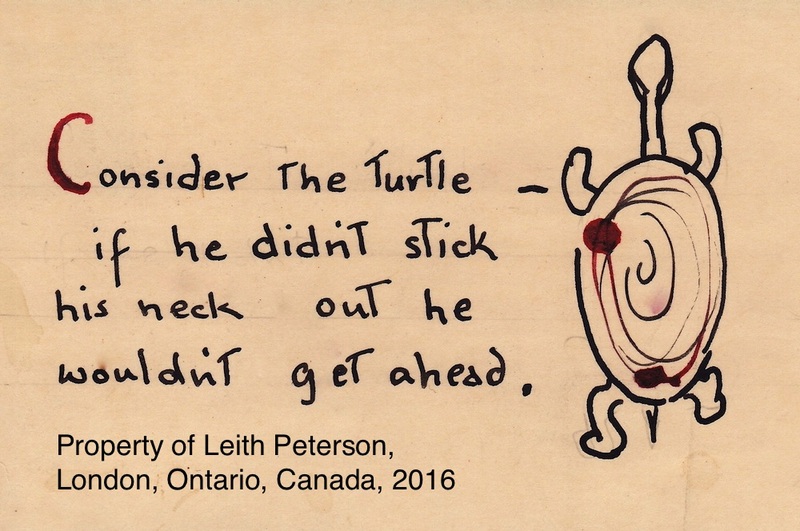 One of the reasons is that the "32 Ojibways, Mohawks and Cree" who he interviewed for the book did not find the "word to be insulting, pejorative or offensive. They used it all the time." Peterson, C.T. (ca. 1970). Peterson, Jessie Royce (Fleming) - "Jay Peterson." London, Ontario. unpublished. Peterson, J. (1975, March). Phase Five: Experiencing Equality [seminar, unpublished]. University of Western Ontario, Department of Occupational Therapy. Disclaimer: My references to the writings of other people do not in any way imply that they share my views on this manner. The opinions expressed here are my own and do not necessarily represent those of my family, friends, or associates. 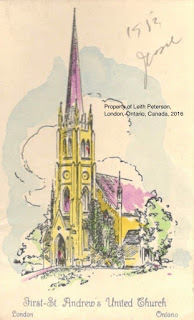 Our family attended First-St. Andrew's (FSA) United Church in London, Ontario. I know my father was involved with various activities at the church, such as teaching Sunday school, but unfortunately I am not aware of any specifics. Have more information about my mother's contribution because I have newspaper articles and other documentation. I have my mother's 1953 drawing of First-St. Andrew's in a scrapbook of her artwork and projects covering the circa 1935 to 1955 period. My mother's father, John Stuart Fleming (1892-1989), wrote "1953 Jessie" on the above artwork. Jessie was my mother's given name, but Jay was what most people knew her by. 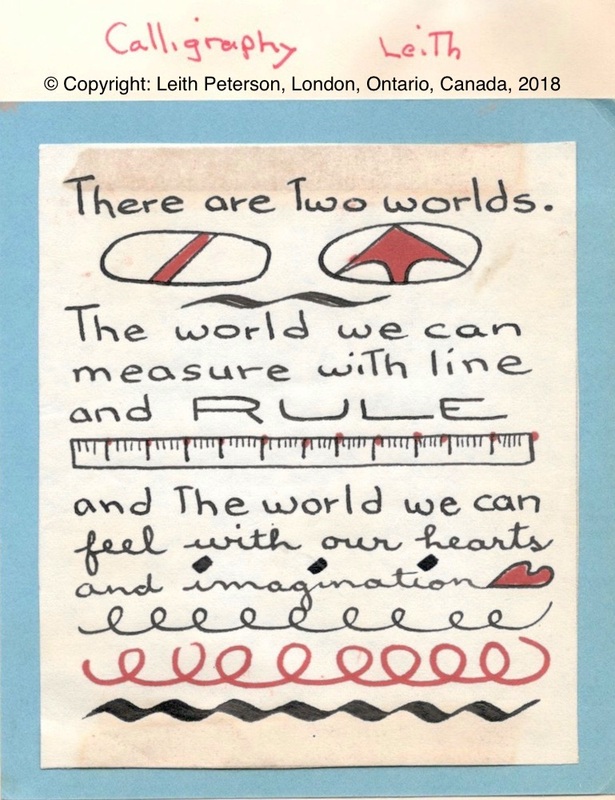 In 1955, my mother provided input into the symbols that were painted on the FSA sanctuary ceiling. In 1975, the symbols were "covered with drywall when some plaster fell." But, in 1999, the sanctuary was refurbished and the symbols were "replaced." In November 2016, I attended the funeral of an old family friend in the sanctuary of First-St. Andrew's. It was nice to look up and see that the symbols are still present on the ceiling. 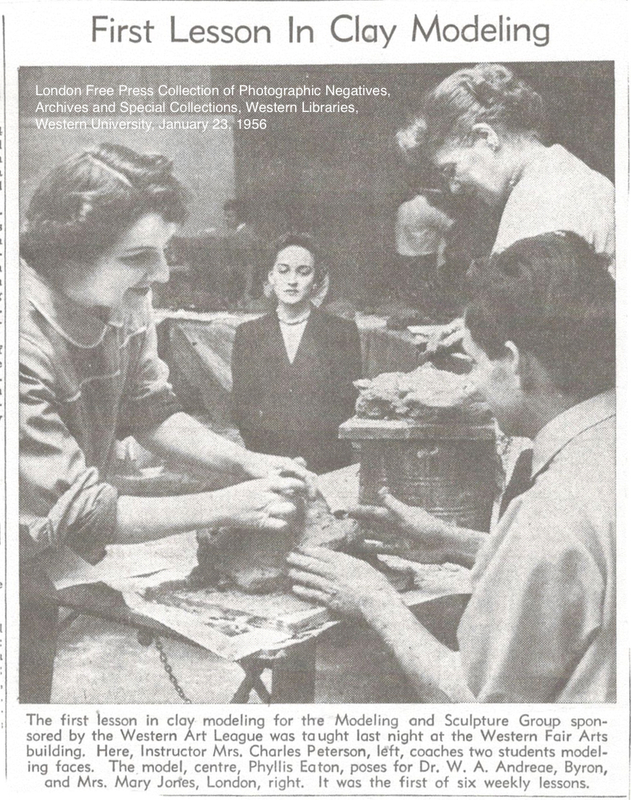 From the late 1950s to the early 1960s, Mom helped organize art and artifact exhibitions for FSA. Some of these exhibitions were described in the pages of the London Free Press. 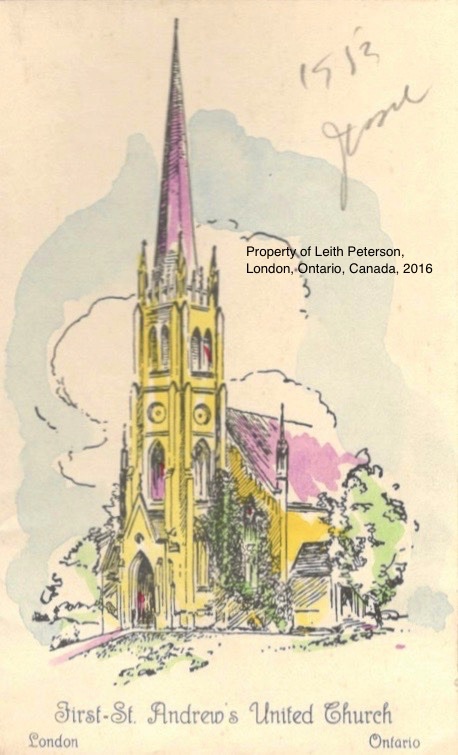 For example, in November 1962, The FSA United Church Women (UCW) presented a "Visual Worship" exhibition of "religious art," which included works by "well-known artists from London and Toronto." In addition, members of the congregation, including the UCW, put together diaplays on the topic. Further, there were a variety of ancient Bibles for attendees to look at. 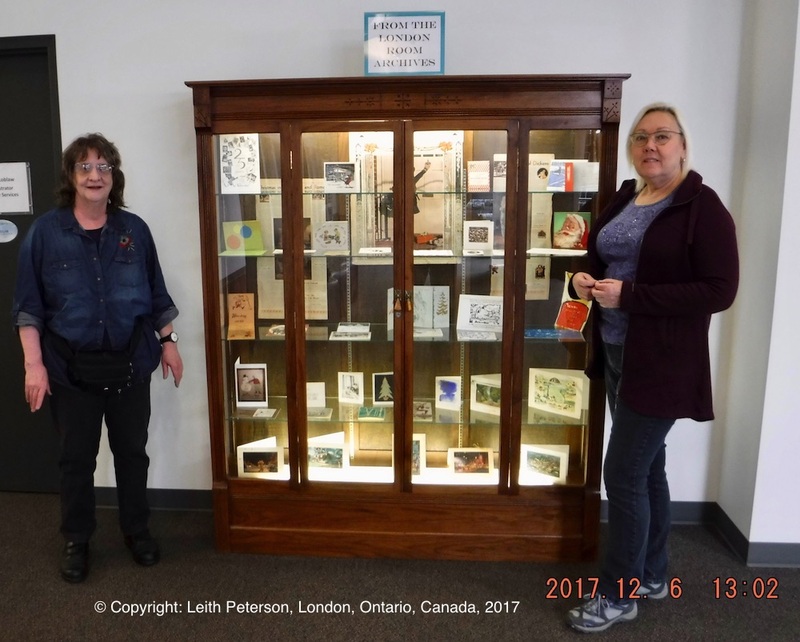 A photo of the display convenor, Mrs. George Young, and my mother, the art-coordinator, examining the Bibles, appeared in both the London Free Press and the United Church Observer. In November 1963, my mother was one of two art co-convenors of the FSA-UCW "Religious Art and Artifact" exhibition held at the church. 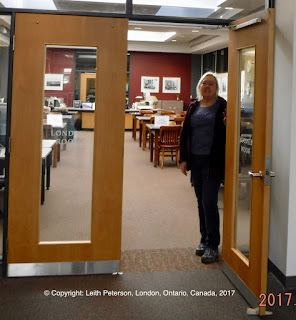 London Free Press columnist, Lenore Crawford, said the collection was "fascinating and worth hours of study. My mother was involved with other programs and projects at the church, so what I have mentioned above is just a sampling. The Very Rev. Angus J. MacQueen (1912-2008) was the First-St. Andrew's minister from 1951 to 1964. He kept in touch with my parents after he moved on to other ministry duties in Toronto. On December 19, 1976, he returned to First-St. Andrew's to give my mother's eulogy. In his eulogy, Rev. MacQueen described my mother as a "very special kind of person, full of courage, goodness and kindness." Four qualities stood out for him: her sincerity, selflessness, openness, and her encouragement of others. I agree with Rev. MacQueen's assessment. In the late 1970s, my father, Charles T. Peterson, moved to Duncan, British Columbia, but when he returned to London in 1997, he started attending First-St. Andrew's again. His memorial was held there, April 4, 2007, with Rev. Dr. David McKane officiating. Rev McKane was the FSA minister from 2002 to 2010. On May 27, 2007, I held a celebration of my parents' lives in Proudfoot Hall, in the basement of FSA. The celebration included binders of archival material, display boards full of photos, and readings by family, friends and associates. The approximately 53 people who attended provided me with lots of positive feedback. Crawford, L. (1963, November [2?]). Religious art in Canada on the move. London Free Press. London Free Press (1962, November 2). Ancient Bibles Displayed at UCW Exhibit. London Free Press. London Free Press (1962, November [2?]). First-St. Andrew's UCW: Religious Art Collection Replaces Bazaar Project. London Free Press. United Church Observer (1962, December). Ancient Bibles displayed. United Church Observer. Disclaimer: My references to the writings of other people do not in any way imply that they share my views on this manner. The opinions expressed here are my own and do not necessarily represent those of my family, friends or associates. My mother not only invented the baby seat mentioned in Part One of Four of this series, she also created a shoulder bag carrier for infants. This carrier was also called the "Babi-Toter." Below is a 1953 photo of my father, Charles T. Peterson, with my brother, Stu Peterson, in the toter. 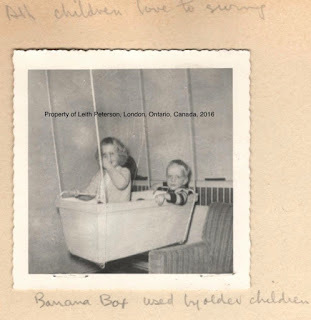 In May 1959, Chatelaine published an article about my mother's baby seat and shoulder bag carrier, entitled "Babies are meant to be near you." This article, by Kae McColl, included a 1958 photo of my mother vacuuming, with my brother, Don Peterson, at her side in the toter. My mother said in the Chatelaine article that she designed the chair and the carrier to keep her children close beside her. I suspect she said this because I was the oldest of her four children and was notorious for taking off as soon as her back was turned. 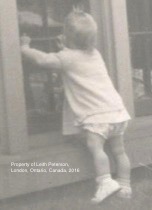 Below is a photo of one-year old me, peering into the floor-level windows of an apartment building down the street from our home at 283 Dufferin Avenue in London, Ontario, Canada. 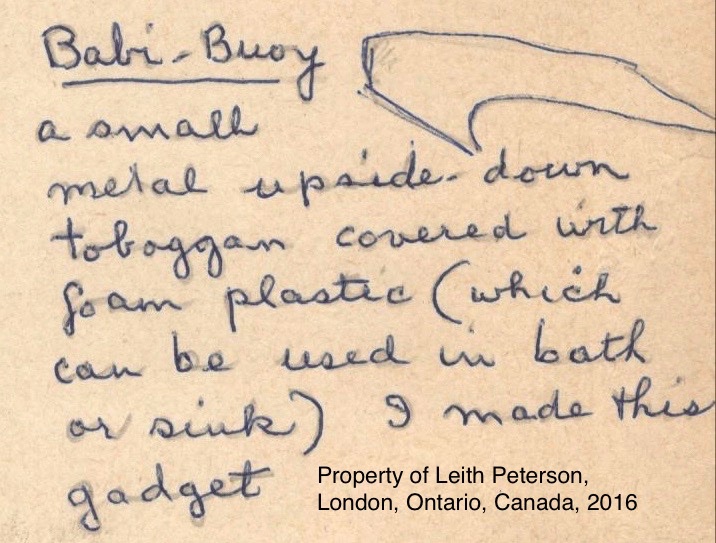 Her Babi-Buoy was a "small metal upside down toboggan covered with foam plastic (which can be used in bath or sink)." Below is a circa 1958 photo of my brother, Stu Peterson, and I enjoying the elevated view in a banana box swing. My mother probably got the idea for this swing from looking at a photo of people swinging in what appears to be banana boxes. She wrote "Algerian" below the photo, so presumably the photo was taken in Algeria. Mom acknowledged that she got her ideas for both the chair and the babi-toter, from researching how women had carried their children throughout the ages. Her inspiration for the baby seat included devices used by the Hupas of Northern Calfiornia and the Ostiaks of Central Russia. The creative spark for her baby-toter partly originated from her examining an over-the-shoulder carrier made by mothers in the Dodecanese island complex of Greece. She also got design concepts from those used by Inuit, Cree, Korean, Guatemalan, Laplander and Nigerian mothers. Although my mother looked into patenting her baby chair and babi-toter, she decided against it because she felt a business venture like that could take her away from her parenting duties. 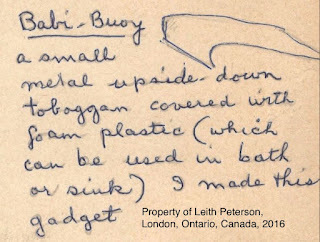 She even provided instructions on how to make the chair and toter in the 1959 Chatelaine article previously mentioned. I see this as yet another example of my mother "painting us all into it," as explained in Part One of Four of this series. 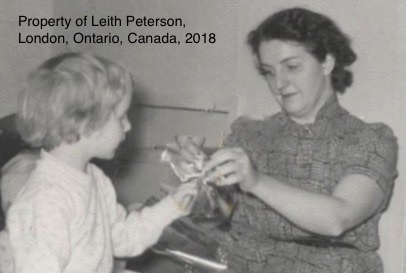 She saw her inventions as part of a timeless continuum of mothers taking care of their children in the best way they knew how. May, J. (1958, November 6). "Necessity Mother of Invention." London Free Press. McColl, K. (1959, May). Babies are meant to be near you. Chatelaine, pp. 108-109. Peterson, C.T. (ca. 1970). Peterson, Jessie Royce (Fleming) - "Jay Peterson," London, Ontario. unpublished. Post contents created by Leith Peterson reflect the views of the author and do not necessarily reflect the views of her family, friends or associates. Any comments made on this blog are the opinions and properties of the creators and do not necessarily reflect the views of Leith Peterson. The inclusion of any links on this site does not imply endorsement of the sites in question. Anyone accessing links from this site does so at his/her own risk; Leith Peterson is not responsible for the contents of anything contained on other people's or company's websites. No text, images, photographs, or any other information on this site can be transferred, copied, distributed or replicated without the express written permission of Leith Peterson. Copyright © 2011-2019 by Leith Peterson. All rights reserved. Simple theme. Powered by Blogger.